Brittany Slingerland-Kitterman has been named the new department chairperson for Hudson Valley's Building Systems Technology department. Slingerland-Kitterman most recent worked as a teacher at Shaker High School, where she taught various classes from 9-12th grades, including residential electricity, photography and graphic design, transportation systems, and special needs technical occupations, among others. She was also highly involved with clubs and extracurricular activities as an organizer and advisor. In her new role at the college, she will oversee six degree and certificate programs, including Clean Energy Management, Electrical Construction and Maintenance, Heating/Air Conditioning/Refrigeration Technical Services, Mechatronics, Overhead Electric Line Worker, and Photovoltaic Installation. She says her goals are to help the department grow, help the students to love what they do, and to see the department be a positive influence on their lives, like it was for her. 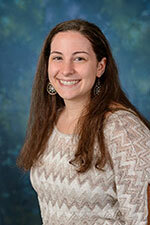 A Hudson Valley alumna, she graduated from the Electrical Construction and Maintenance program in 2009. She went on to get her bachelor's degree in technical education from SUNY Oswego in 2011, followed by a master's in technology education from Ball State University in Indiana, which she completed online in 2013. She is currently pursuing her Ph.D. in educational policy and leadership from the University at Albany. Slingerland-Kitterman said that her decision to return to Hudson Valley was sparked by her interest in taking on a more administrative position, along with a desire to get back to her alma mater. She said she knew from her time as a student that the college was a positive place, and that those memories made it easy to choose to come back. "I'm really excited to be back here," she said. "Out of all the schools I've attended, public and private, Hudson Valley was the best. The faculty were so involved and helpful." She explained that she looks forward to making a positive impact on her students' lives, much the same way her teachers made an impact on her. "In these programs, you see students continually until they graduate. It really increases the quality of their education when you take an interest and get involved with them."